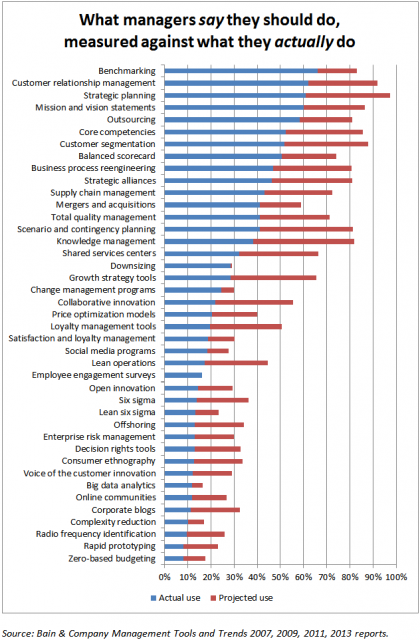 A brief follow-on to my earlier post about Bain & Co's Management Tools and Trends survey. Each of Bain & Co's surveys provide a very unusual source of data by asking managers to identify which management tools they currently use as well as ones they are forecasting they will use. Since the survey is biannual, we get data on alternating years of actual use versus projected use. In other words we get 2006 actual figures, 2007 projected figures, 2008 actual figures, and so on. From this we can calculate what might be called an average "optimism factor": Management tools that managers "should use" or "hope to use", but never in fact get around to deploying in their organisations. The results are fascinating. Perhaps unsurprisingly, managers are always over-optimistic about which tools they intend to use over the ones they actually put into practice. But the scale of the over-estimation was very surprising to me. "Knowledge management" was always a problem child. According to Bain & Co's figures, initiatives relating to KM were actually conducted only by half of the managers who identified it as important to them. But even something as basic as strategic planning, despite being nearly universally regarded as important, was never actually done by 4 out of 10 managers. Generalising, it appears that management tools where a successful implementation can't be determined until some point in the future are most likely to be quietly dropped off the agenda, even if lip-service is being paid to their importance. So benchmarking, balanced scorecards, and core competencies generally get done if identified as important, since there is a tangible product that can be related to current operational efficiency at the end of the process. On the other hand customer segmentation, business process reengineering, scenario and contingency planning, and collaborative innovation are much less likely. The problem is that the value of these initiatives can be immediately questioned while their benefits will only become "proven" some years into the future. While operational efficiency is important, organisations that don't have enthusiasm for implementing risk-based, future-focused activities are very likely to fall foul of the next disruptive innovation. It would be fascinating to compare the answers of people who self-identify as "managers" versus those who identify as "leaders". My guess is that "leaders" would be far more likely to follow through on future-focused activities. Strong leadership in the face of uncertainty is not easy, but activities that boost the adaptability and resilience of organisations to changing circumstances will be the best way to ensure long-term success.